Across the United States, nearly 4.5 million K-12 students are English language learners. From 2004 to 2014, the percentage of public school students participating in programs for English learners increased from 8.8 percent to 9.3 percent. That represents an increase of about 240,000 students in a decade—including a jump of more than 60,000 during the 2013-2014 school year. You’ll find the highest proportion of English learners in kindergarten, at 17 percent. California alone has 1.4 million English learners, 22.7 percent of the statewide student population. According to the National Center for Educational Statistics the languages English learners are most likely to speak at home are Spanish, Arabic, and Chinese—and at least 30,000 speak Vietnamese, Hmong, Haitian, Somali, Russian, or Korean. And in the case of one family I know very well, three of these in English Language Learners class speak Dutch. Whatever their linguistic backgrounds, we want all students to succeed, but too often a lack of language familiarity interferes with students showing what they know. What is 24 divided by 6? I’m certain you know the answer: 4. Now, "¿Qué es 24 dividido por 6?" Do you still know the answer? Finally, what if I had asked this question first: “什麼是24除以6?” Are you still sure? Your math skills didn’t change as I asked the questions, but the languages did. If I try enough languages, at some point your lack of fluency will override the skill being measured—your facility in math. When educational measurement is “confounded” by extraneous factors, validity is lost. Even Einstein would struggle with math problems written in languages he had never encountered. Using the language of psychometricians, the net result is a false negative. In words we can all understand, it’s simply not fair. To enable more students to demonstrate their abilities, starting in the fall of 2017 ACT will offer supports for qualified English learners in the United States taking the ACT. These supports will include limited additional time to take the test, the use of an approved word-to-word bilingual glossary (containing no word definitions), test instructions provided in the student’s native language (limited languages at first), and testing in a non-distracting environment. Most importantly for these students, the test results will be college reportable. To do well on the math test, students will still need to know math. Similarly, they will also need to need to know English, Reading, and Science, the other subjects covered on the ACT. In English, the test measures usage, mechanics, and rhetorical skills; it’s not a vocabulary test. A bilingual glossary helps even the playing field, but does not define the words on the test. For example, if you were a Spanish speaker learning English you may not understand the word “rhetorical” but you would likely understand the Spanish word “retórico.” The glossary doesn’t define “rhetorical.” It only clarifies the word is one you already understand in your native language. ACT’s move to better support English learners is consistent with the federal Every Student Succeeds Act (ESSA), which calls for educators to help students whose difficulties in speaking, reading, writing, or understanding the English language may deny them the ability to meet challenging academic standards, achieve in classrooms where the language of instruction is English, or participate fully in society. We’re proud to be the first major assessment organization to offer the English learner supports I’ve described. We hope others in our profession will follow our lead. 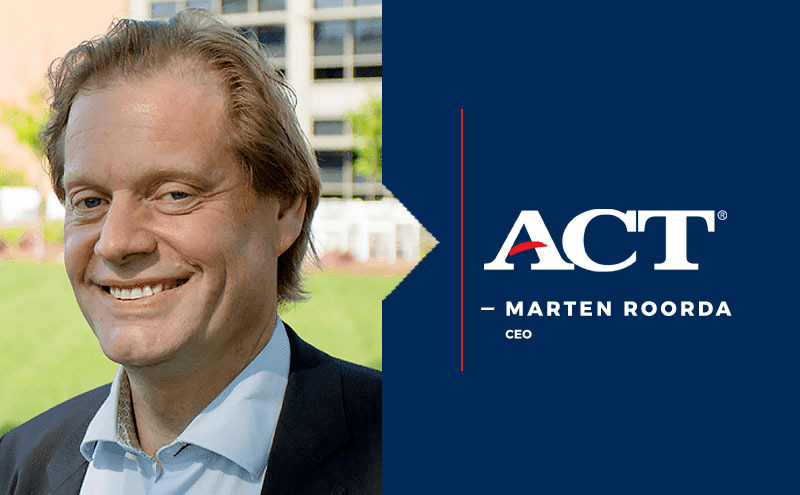 The bottom line for ACT is not about being first, but about being fair to the nearly 5 million students across the United States whose first language is not English, including three young children who sit at my kitchen table—mostly speaking Dutch—each and every evening. All students deserve the opportunity to show what they know. Starting next fall, with the ACT, they will.